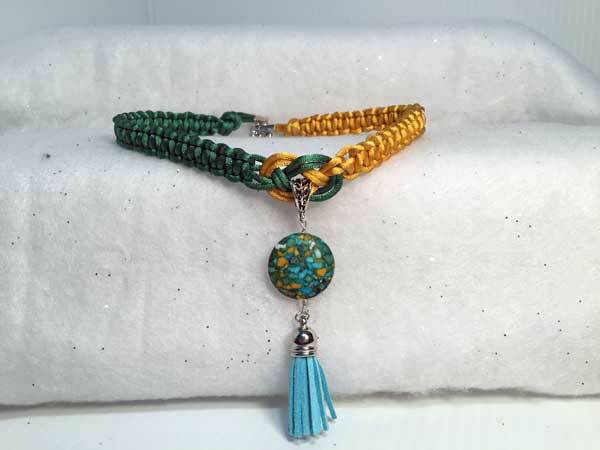 This corded necklace is made using Satinique cording for a beautiful piece with some beautiful shimmer. It measures 16.5 inches with a center jeweled piece that adds over 3 more inches. It is done in a green and gold. The focal bead is a large coin stone with that reminds me of stained glass in mainly gold, greens and turquoise. Hanging separately from that is a turquoise suede tassel with a silver cap.